In a recent journey that connects two different times and two different continents, I’ve come to appreciate the impact that one individual can have when he struggles in a mighty way to find God’s will for his life. Both men have gone viral in their own time. To me, both are inspiring stories. One was Martin Luther whose stand triggered the Reformation in 1517. The other was Glenn Beck whose recent Restoring Honor Rally touched hundreds of thousands in attendance and even more who were watching from afar. One took advantage of the printing press, the other the Internet and media coverage. Both took risks to take a stand for God and for the rights of individuals to be free to find their own way to faith. On a recent Path of Luther Tour in Germany, I was confronted again and again by the power of one lowly priest, preaching in a remote German village who, relying on God and Scriptures, helped unleash the fire of a living faith that transformed an age. Because of his offenses against the Pope and Rome, Luther was never allowed to enter the Imperial Cathedral of St. Peter and St. Paul in Worms, but, today, it remains the only Catholic cathedral to have a stained glass window honoring the German reformer. On August 28th, on the steps of the Lincoln Memorial, Glenn Beck avoided political attacks and partisan rhetoric. Instead, he called on Americans to get on their knees and get right with God. For it was only then that America would again find its way. Like Luther centuries before him, he called for an awakening to the power of faith in God. Glenn Beck and the thousands attending lit a spark to put faith on fire in this great country. Luther put the Bible in the hands of the average believer to let them experience a personal relationship with God. 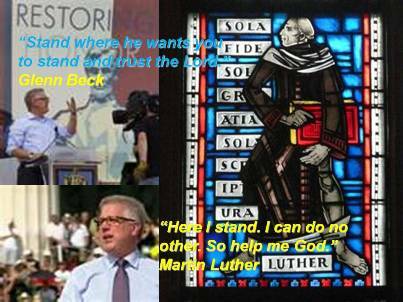 When, to Luther’s dismay, they turned their passion for freedom into attacks on others, Luther implored them to stop. Glenn Beck did the same. Instead of condoning hatred, he called for a change in heart. Since then, there have been numerous critical and supportive comments and commentary. I wish only to add that I respect the risk he took to speak and live his faith. History is the best judge of true impact. But both men in their own time speak to the power of purpose in creating optimism for the mission they espoused. What are you doing to let the power of purpose and faith work in your life?